Two experiments examined the link between interpretation and memory in individuals diagnosed with Generalized Social Phobia (GSP). In Experiment 1, GSP and control participants generated continuations for nonsocial and ambiguous social scenarios. GSP participants produced more socially anxious and negative continuations for the social scenarios than did the controls. On the subsequent test of recalling the social scenarios, intrusion errors that shared meaning with the original continuations were made more frequently by the GSP group, producing false recall with emotionally negative features. To examine whether nonanxious individuals would also produce such errors if given emotional interpretations, in Experiment 2 the authors asked university students to read the scenarios plus endings produced by GSP participants in Experiment 1. The students either constructed vivid mental images of themselves as the main characters or thought about whether the endings provided closure. Low-anxious students in the closure condition produced fewer ending-based intrusions in recalling the social scenarios than did students in the other 3 conditions. Results illustrate the importance of examining the nature of source-monitoring errors in investigations of memory biases in social anxiety. Hertel, P. T., Brozovich, F., Joormann, J., & Gotlib, I. H. (2008). 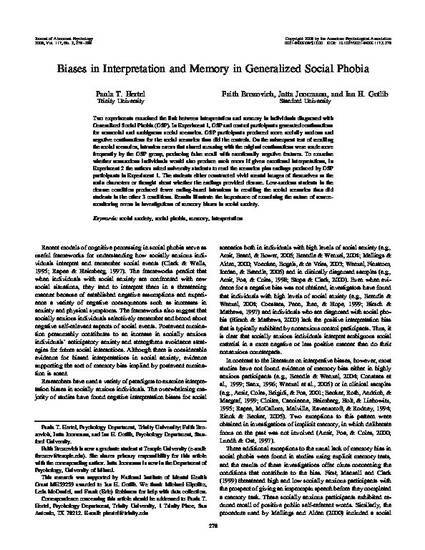 Biases in interpretation and memory in Generalized Social Phobia. Journal of Abnormal Psychology, 117(2), 278-288.